Recently the solar airplane Solar Impulse 2 broke a world record flying around the world using SunPower® solar cells. But what about powering something a little closer to the ground? We’ve done that, too, energizing the dreams of competitive solar racecar teams. SunPower gives teams, often comprised of college students from around the world, access to our high efficiency solar cells at a reduced price. So far, we’ve provided cells to 25 solar racecar teams in North America, South America, Asia, Australia and Europe. 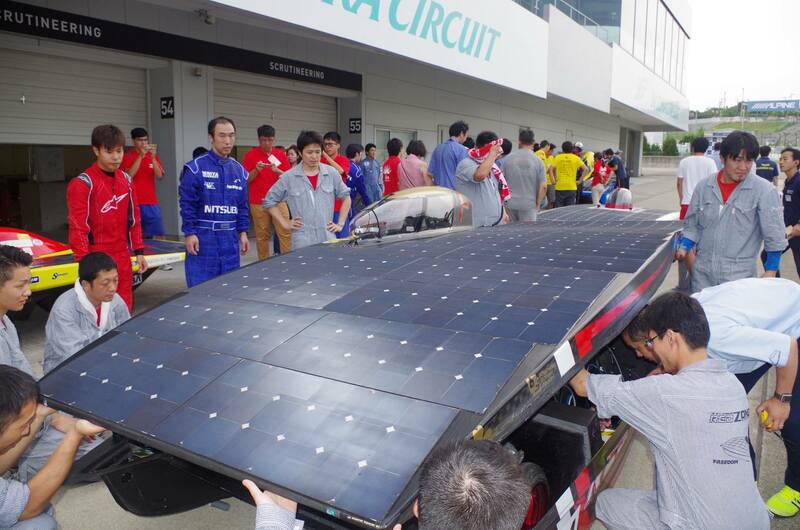 One of the many teams that use our solar cells, Team RedZone of Japan, was the victor in the recent Solar Car Race Suzuka 2016, a track race in Japan. Team RedZone named their car Freedom, hoping to inspire others to feel free to try anything and to create something better than what exists. That’s something we at SunPower can identify well with, as we’ve been aspiring for 30 years to push the boundaries of innovating in solar technology. The team first raced their car in the 2015 Sukuza Solar Car Race, winning the new Olympia class and placing second overall. But Keisuke Nomura, team manager and self-described “ace driver” of Team RedZone, felt they were at a disadvantage against other classes as they were limited by surface area and number of solar cells while other classes were not. This year was a different story. Freedom placed first overall in the Sukuza race, even against other classes. And, they posted several new records, including recording the fastest lap in the race and the most laps (70). They bested last year’s champion team, which was not using SunPower solar cells. What’s next on the solar car racing circuit? The World Solar Car Challenge in Australia in October 2017. SunPower, which routinely provides cells to many of the top cars in this race, is already fielding requests for solar cells. Our company has a long history of working with solar pioneers of all kinds, providing solar cells for everything from satellites and experimental unmanned solar aircraft to NASA projects. Read our series of inspiring solar vehicle stories on our blog to learn more about these projects and to find out how this same high efficiency solar can provide clean energy with our solar for businesses and home solar system solutions.